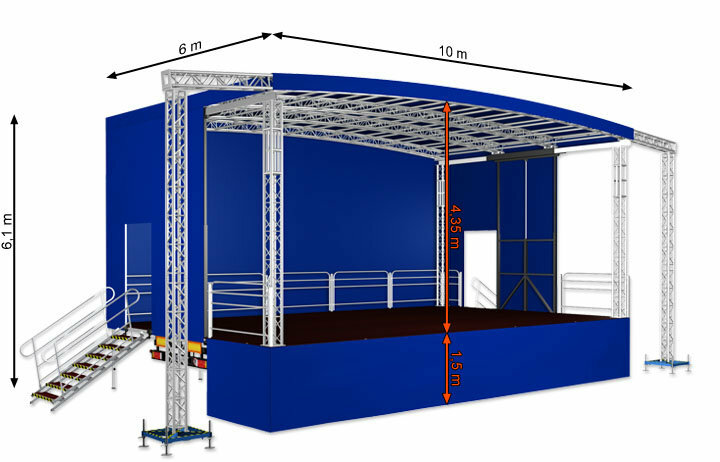 The newest of our stage hire department's range of outdoor stages are the quickest to build. Three brand new Trailer stages 10m, 7.5m and 5m. The largest of our mobile trailer stages is the 10m. It is available as the basic mobile stage, an either the addition of PA wings or full depth tech bays. Two sets of steps are provided as standard, as are handrails on rear and sides. A ramp can be added. Assembly time can vary depending on ground conditions, slope and weather. access for less abled patrons. The 5m stage is the smallest trailer stage on our fleet. Its size is a real asset, as it can fit in most high streets, giving a flexible stage solution. The structure is great for christmas light switch on’s, opening ceremonies and small radio roadshows.